Quite recently I was approached by some leading members of the Monday Club and asked if the Lewiston Public Library would be interested in keeping and preserving their records. Of course! I answered. And I was very excited to see these records. They are now being housed in the library and I am working on digitizing some of the older pieces as they are incredible artifacts of Niagara history. It was formed as the outgrowth of a meeting held at Mrs. Rosenmüller’s where she invited a few ladies to hear her sister Miss Mercer read a paper on the “North American Indians” which she had read before a club at Pittsburg. The club was organized with the intention of making an exhaustive study of American history. 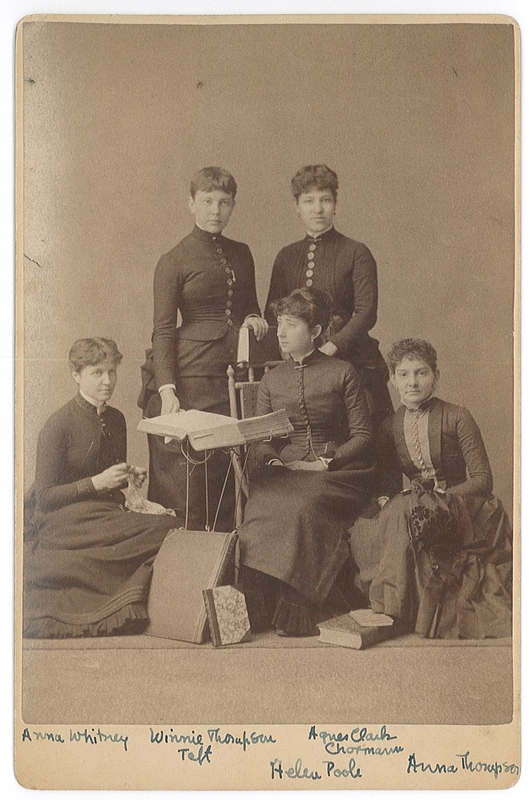 The first meeting of the club was held in January of 1894 with the following members: Mrs. Benham, Mrs. Ely, Mrs. Hardwicke, Mrs. Lamont, Mrs. Hastings, Mrs. Nye, Mrs. Rosenmüller, Mrs. Redpath, Mrs. Rhodes, Miss Pool, Miss Whitney, Miss Thompson, Miss Trott and Miss Oatman. As in other women’s clubs, there were by-laws and “rules and regulations.” Nothing very complicated. “The object shall be the study of literature, and the literary and social entertainment of its members.” The meetings were held every Monday afternoon from October until June at 2:30 in the afternoon. 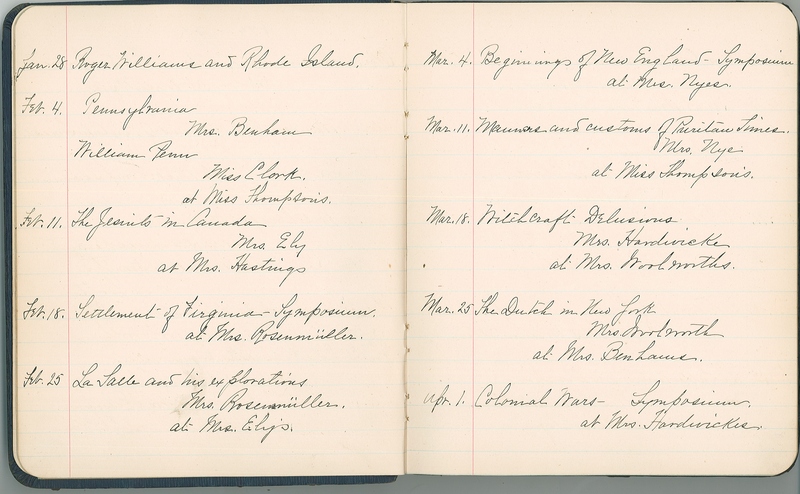 The number of each class limited to fifteen members and there was a twenty-five cent fee for membership, as well as a fee of $1 for the member who failed to read their paper at the appointed time (unless prevented by illness or absence from the city). Easy enough! Each Monday one of the members would present a well-researched topic and discussion would follow. Some of the topics included William Penn, Witchcraft, Lace-Making, Italy and the Madonnas…to name a few. Some topics were explicitly forbidden (the subjects of politics and religion). The meetings were held at the women’s homes and topics would be assigned for the seasons. 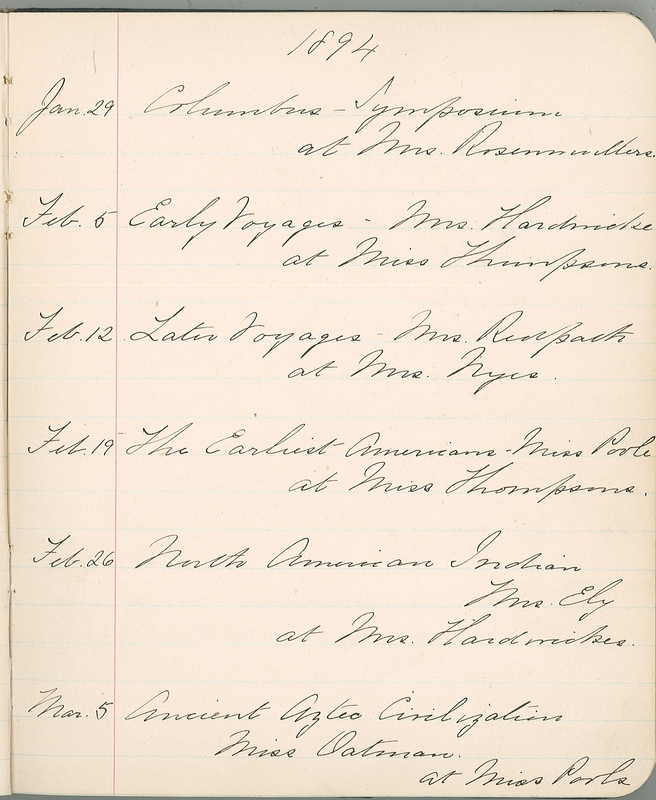 Normally refreshments were simple…”cake or sandwiches with coffee or tea.” However there were more elaborate occasions from time to time such as the meeting held at Miss Thompson’s home on March 7, 1900. On this day a club luncheon was held with the following menu: grapefruit, Little Neck clams, brown bread, bouillon, chicken croquettes, mushroom sauce, tomato salad, cheese sticks, ice cream-nut kisses, salted almonds and bonbons. 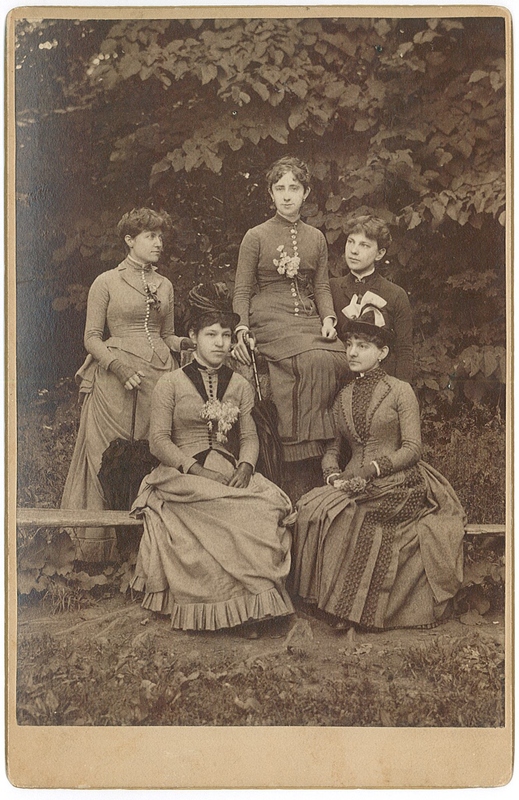 Some of the early members included prominent members of Niagara society such as: Miss Anna Thompson, Miss Helen Poole, Miss Margaret Bentham, Mrs. Alan H.G. Hardwicke, Miss Flora Gaskill and Miss Winny Thompson. Anna Thompson was the “alert, intelligent maiden lady” who lived for years at 124 3rd Street. She attended Mt Holyoke College with her sister, Winny Thompson, who later married Horace Taft, President William Howard Taft’s brother. Miss Helen Poole was the sister of William Poole, famed Niagara newspaper man. Miss Bentham was a librarian with the Niagara Falls Public Library. Mrs. Hardwicke was part of the Ware family with long-reaching ties to Niagara Falls History. In fact her great grandfather, Jesse Ware, was considered the first permanent white settler of Niagara Falls. Miss Gaskill was the daughter of Colonel Charles Gaskill, a prominent military man and former president of the village of Niagara Falls. Mrs. Rhodes’ husband was the civil engineer who installed the very first electric arc lamps on Niagara Falls streets and in several business places. Mrs. Rosenmüller (who held the first meeting) was a most interesting woman, herself, as she ran rooming houses at Niagara-on-the-Lake and eventually rented out apartments to visiting Niagarans in New York City– after separating from her husband. Monday Class members’ husbands were presidents of banks, presidents of railroads, mayors, doctors, giants in the power companies. Hopefully as we research more the stories of the women, themselves, can be shared more fully as they were vibrant and intelligent women and members of society but often hidden behind their husbands’ deeds and achievements. Throughout the years various changes were made but the club basically remains a women’s club that meets on Mondays to discuss educational topics.